Drinks, networking and design talk! 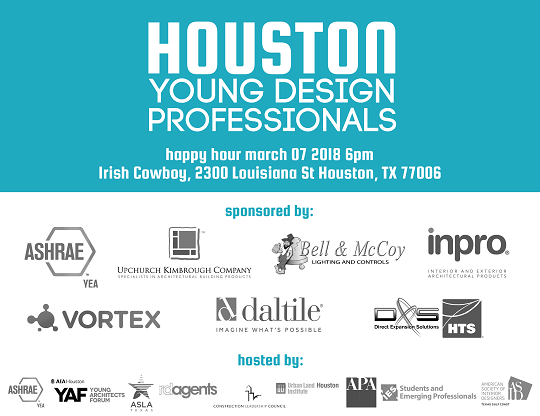 Come make new connections with fellow Houston Young Design Professionals! Hosted by the AIA Young Architects Forum, AGC Construction Leadership Council, American Society of Landscape Architects, American Planning Association, Young Engineers in ASHRAE, and rdAGENTS, American Society of Interior Designers and the Illuminating Engineering Society. Hosted Spring and Fall. Join us Wednesday, March 7th.